Sapporo (Hokkaido Prefecture) Data: JMA. 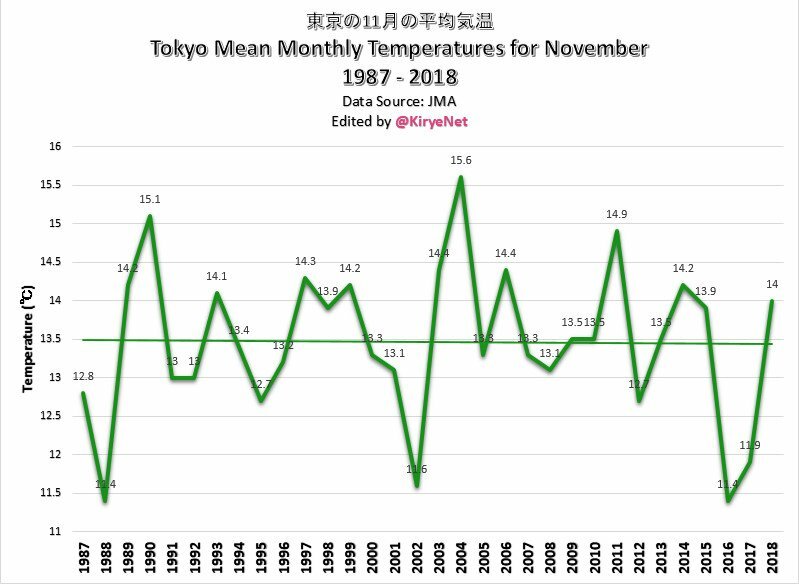 Tokyo mean November temperature have been flat for more than 30 years. Data: JMA. The above chart shows only a very modest warming since 1997, a period where the public has been only hearing and seeing headlines of rapid warming. But as the trend shows, the warming is statistically negligible, and is likely due to the natural natural El Nino event of 2016. 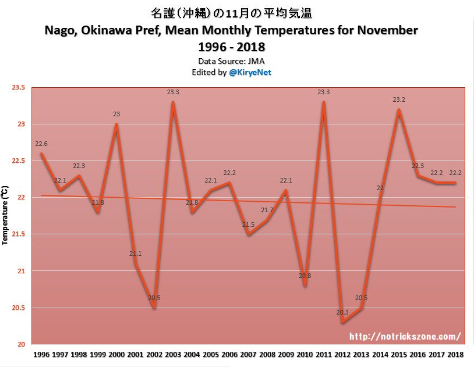 To summarize, Japanese citizens can say ‘sayonara’ to all the scary warming they were told to worry about over the past 2 decades. Nothing unusual has happened, or is happening. The presentation here amounts to cherry picking in an overall warming trend. On the chart that you link, it is interesting to note that 1960 is the warmest year (with a plus 1 deg C anomaly). 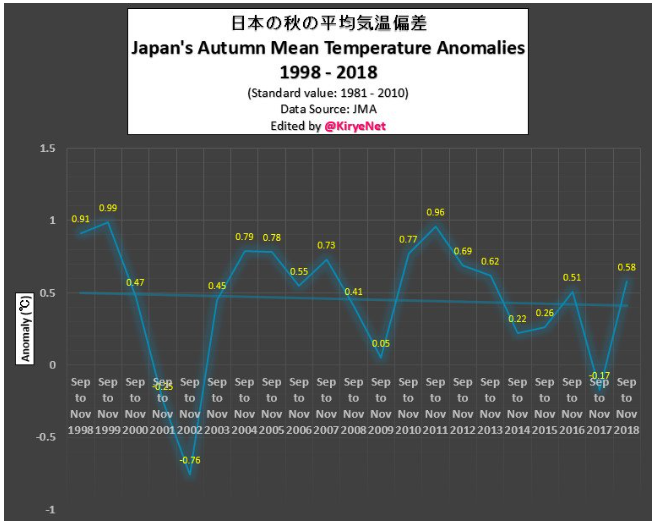 So after almost 60 years and ever rising levels of CO2, Japan is only as warm as it was in 1960. Thank you for just proving that you have no idea what a trend is. Would you say it didn’t cool since summer when you experience a particular warm day in December that reaches the same temperature as a cold day in summer? If the press would actually adhere to the last statement our troubles would be over for the most part as the whole scam collapsed. But if that happened this blog and a bunch of others would be kind of redundant. Is it just me or are plots #1,2,3, & 5 missing? I’ve viewed this on IE and Firefox and don’t see them. I reposted the images…hope they now appear to you. No final image as of yet, 5:30 pm Atlantic Time. The recorded warming over the past 30 years is primarily in the high NH latitudes. This is directly attributed to the transport of ocean evaporation from lower latitudes. It is not rocket science. 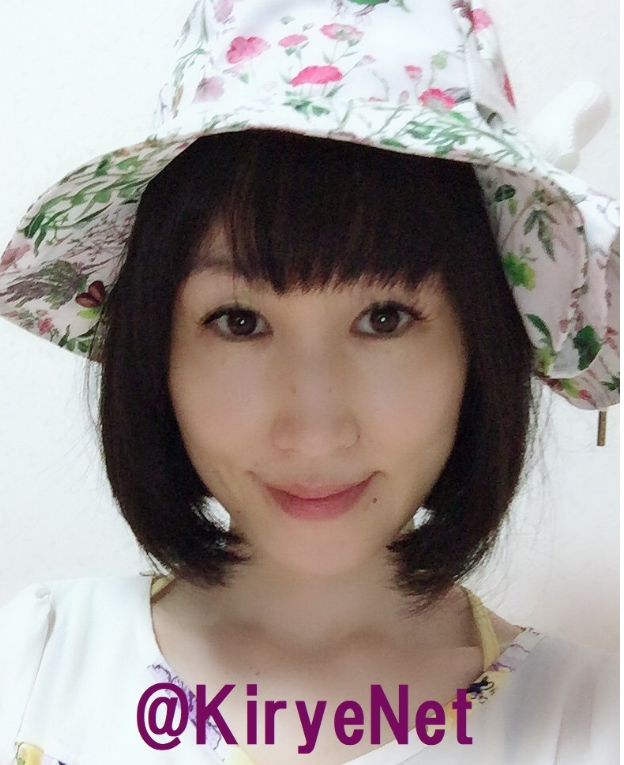 My thanks to Kirye for these informative and valuable updates. Even the tiny appearance of warming in that data might disappear if the UHI effect were removed from the data. ** But I prefer it not. I no longer trust them with any data tampering, even if it might be legitimate. Wait what? 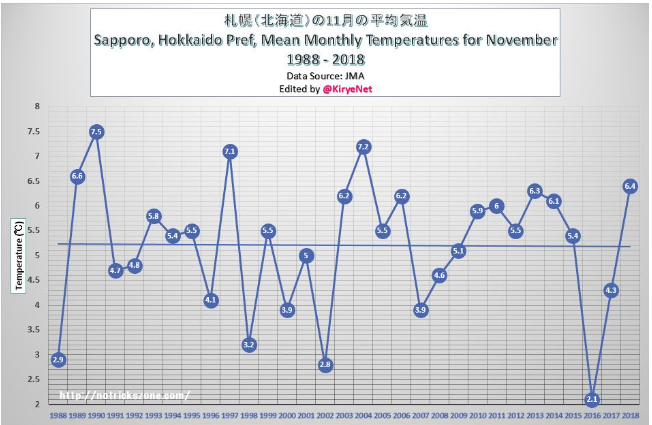 Someone presents a temperature graph of a major city not warming significantly in a specific time frame and you come around and claim all warming on the UHI effect? 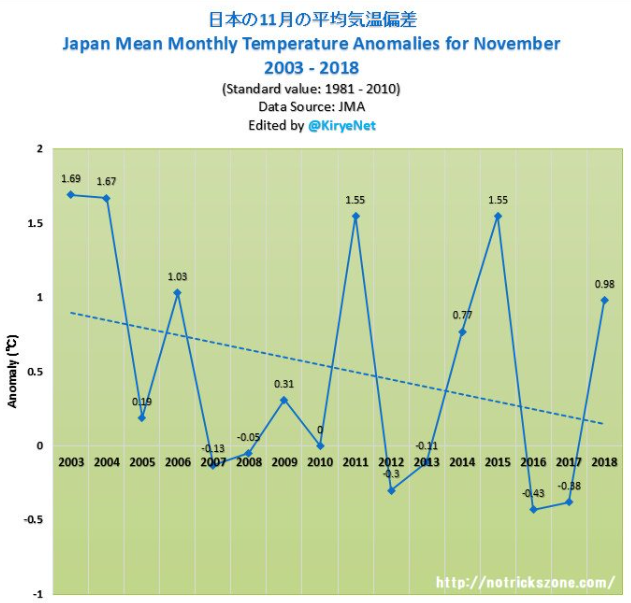 Apparently the UHI effect doesn’t cause warming in Tokio, how come? How is NTZ like San Francisco? The troll is back, and so is the troll-poo. I know that SebH is reality challenged, so I’ll try to spell it out for him (like that’ll help). If you don’t write something SebH can criticize, don’t worry – he’ll just make something up and criticize that. And he wants us to think he isn’t a troll – hahahaha! If you don’t write something SebH can criticize, don’t worry – he’ll just make something up and criticize that. True, that. And the sad part is, he knows exactly what he’s doing when he makes stuff up that we never wrote. Does Japan have an equivalent to the Rutgers Snow Lab? As our Earth turns on it’s axis (counter clock wise, I think) rotating between 19 and 23 degrees the weather patterns change every few hours and often daily. Over a 10,000 year period there is definately a pattern. At some point there will be snow in Miami, Florida. The only thing that disrupts this cycle are natural events like an earthquake, hurricane, maybe a major fire or flood. You are inconsistent with the rest of your fellow skeptics and forgot about volcanoes. Your fellow skeptics claim that we are now on a cooling trend path, that 10000 year cycle of yours didn’t last very long then. Your fellow skeptics also claim that the current temperatures aren’t even as high as in the MWP, a phase just a few hundreds of years back. Was that the 10000 year cycle as well? It’s CO2 that is causing the general warming of this planet expressed in an ever increasing heat content. 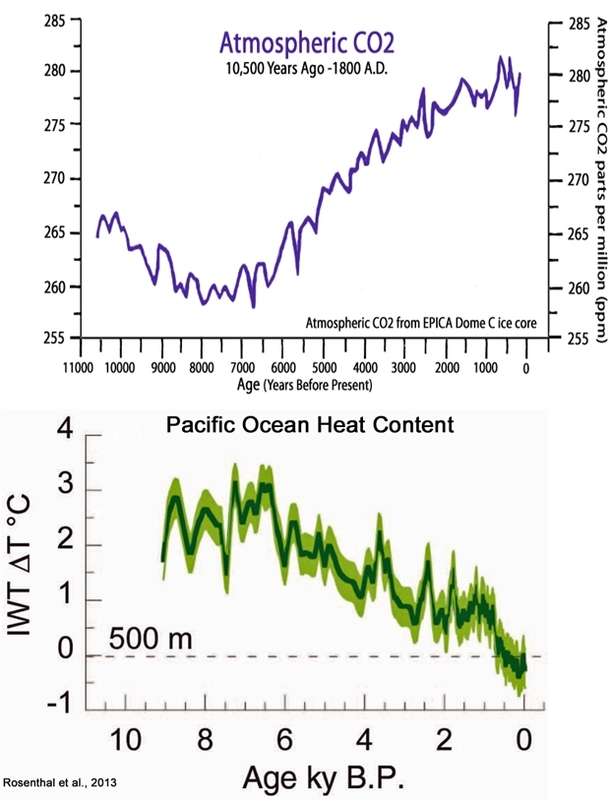 And considering the ocean heat content has changed by a minuscule 0.02 K since the mid-1990s, and that more land area is above sea level today than during the 1980s, where is the evidence for an anthropogenic influence on the heat content of the planet when considering the long-term context of the Holocene? 1) are you again implying that if more CO2 would case OHC to increase now that there surely must have been more CO2 when the OHC was higher than today in Earths history? Is that the same scale as the one Rosenthal uses? Well, for the sake of the argument let’s assume it is. So, 0.02 K in 30 years. 0.2 K in 300 years, 2 K in 3000 years. 4 K in 6000 years. 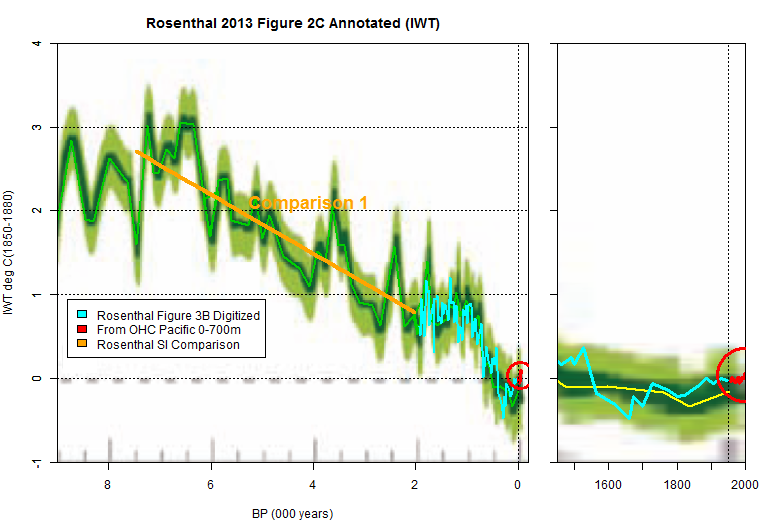 Continuing on that path will increase the heat content towards what Rosenthal claims that is has been in the distant past. Why is that minuscule again? Perhaps you mean the rather fast current increase is only a fluke? Natural variation in a general downtrend. Why don’t you re-read that 2018 Rosenthal paper then and try to understand what it says about the connection between surface temperatures and heat content? You like graph C in figure 2, what about graph A and B? What do you see? where is the evidence for an anthropogenic influence on the heat content of the planet when considering the long-term context of the Holocene? Are you waiting for an upward spike in those kinds of heat content graphs that span 10000 years? A heat content hockey stick if you will? No, I am implying that since the models that claim rising CO2 concentration is and has been a primary determinant of OHC increases, this claim is undermined by the extensive paleoclimate evidence for the past 10,000 years that show the OHC (and SSTs and land surface temperatures) were all much higher when CO2 concentrations were much lower — the opposite of what the climate models say should have happened. According to Rosenthal et al. (2013), the OHC dropped by -0.9 C between 1000 AD and 1600 AD (the MWP to the LIA). 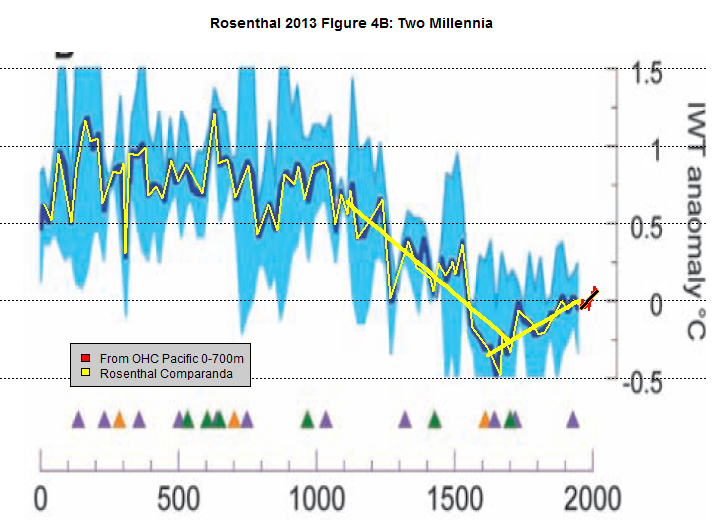 (Actually, it looks more like a -1.3 C drop between 1000 AD and 1700 AD, but -0.9 C is what the abstract says.) That’s a rate change of -0.015 C per decade for a 600-year trend. Comparing a 30-year period (or a 20-year period in this case) to a 600-year period, and still having the 600-year trend exceed the rate of change in the 20/30-year trend…does not support your contentions that modern OHC changes are alarming or unusual. Here’s what they look like relative to the last few centuries/millennia. Scary? Perhaps you mean the rather fast current increase is only a fluke? There’s nothing “fluke” or even unusual about the current changes…. Lyle ,what sort of pollution are you talking about? For the past million years Ice Ages have occurred roughly every 100,000 years. Roughly, not exactly. And earlier still, Ice Ages are thought to have occurred at less than half that periodicity.